Great for breakfast meetings and brunch parties, this Polar Pak 2020 6-cup high top cupcake container can hold six cupcakes or muffins! Whether you choose six of the same flavor, or mix and match popular choices, this container's crystal clear appearance allows you to showcase your baked goods with eye-catching displays. Furthermore, the container's efficient design enables your bakery or grocery store's customers to select baked goods and carry them home with ease. Finding these was a dream! They are perfect when I have clients that want different flavors. I can separate them professionally, pile the icing high, and even add toppers! The travel nicely too. I don't stack them unless I have reinforcements like ribbon to ties stacked containers together. Great height, great buy! Great for regular size cupcake and muffins. The extra space at the top is nice if you're doing a very decorated cupcake with tall icing. I love these containers! I use them for pop up sales farmer’s markets, and love that I can sell a small pack of cupcakes (because not everyone wants a dozen). You can really swirl these high and have plenty of room for decorations or cupcake picks. My Culinary Class used this food storage box to pack our cupcakes topped with Italian Buttercream in. The box was durable and spacious. There are thumb holes to make it easier to take cupcakes out of the box. I would definitely recommend this box. Love how tall these cupcake holders are which leaves a lot of options for decorations. Overall I'm very happy and you can't beat the price! Fast shipping too! I use a lot of these when I am sponsoring a cupcake show in which cupcakes can be purchased in a quantity of 6. These are very reliable containers to store your treats! These containers are perfect & super affordable! They are easy for customers to handle, which I think is super important, I’ve had containers that don’t close correctly or get stuck, but these are great & durable! I also prefer them over the cardboard boxes because I feel like they keep my cupcakes fresher! These containers are so easy to use! They snap tightly closed and hold the cupcakes in place. The crisp, clean look of the packaging helps in displaying your product. They are also easy to stack without smashing the product inside. I really like these containers. We sell a lot of cupcakes at Wonderland Bakery and sometimes people will buy 4 at a time or even 6. This container is perfect for that because then they can all fit in 1 fairly priced container, the customer is happy because they have half a dozen of our delicious cupcakes right in one sturdy container and we're happy because we didn't have to spend a ton of money on the box. Everybody wins!!! Winner, winner, cupcake dinner! best containers for our mini cupcakes! we love how easy they close and tall enough to fit our cupcakes without smashing the frosting. They stack well and hold the cupcakes very well. These are great container I've used for cupcakes and strawberries as well, they handle well with travel as well. I will but these again thanks. I love these containers. I use these the most. I like purchasing the packs because I’m a small home bakery and it’s always nice to use these as little sampler packs! These are great for when the customer doesn't want a full dozen. They are good quality. However, they can be hard to reopen once closed. This six pack cupcake container is just what I was looking for. It is high enough for icing to not get messed up and holds six cupcakes without moving around. These 6 cup containers have the perfect stability for transporting and the clear plastic showcases your product so everyone can see without having to open the containers. These are excellent containers. They are durable and have a strong hinge. They hold the cupcakes secure with enough height for even lotus style papers and frosting. Love these containers! Have compared price and quality to many websites and these are absolutely the best deal! Containers allow easy put in and take out of individual cupcakes! Thank you for the review Claudia. We’re sorry this has not worked well for you. For an alternative that might better meet your needs, try this 6 Compartment Clear Hinged High Dome Cupcake Container instead! LOVE, LOVE, LOVE these cupcake containers. They have plenty of room for the most elaborate of piping on cupcakes as well as being stable and keeping your cupcakes from being damaged in transit. And it's always nice for people to be able to see what you've made. These containers are great. They are easy to open and close, yet very sturdy. They fit a standard size cupcake with plenty of frosting. We use about 200 per week. LOVE these! These are an essential part of our business, and our customers love them too! They are very sturdy, come apart from each other easily, and are a great height for our cupcakes. These are tall enough for every one of our cupcake flavors. If you don't need a lot of height, you might consider something shorter to save money. The base of our cupcakes fit in these perfectly - don't move around a lot, but enough room to easily remove them. I love these containers. The quality is amazing. I love how you can see through them. I wish they had these in the standard size for 12 cupcakes. Perfect for taking cupcakes to the grandkids school parties. It never fails with a plain box, they slide around or get squished. And, it’s not a “have to get it back” kind of thing, which is sometimes much more convenient than using a bigger cupcake carrier and then having to get it at the end of the party, especially if there are cupcakes left over that you want to leave for a later snack for the kids anyway. Awesome Product. Holds cupcake and icing neatly. The frosting was not at all damaged during transport. The material is sturdy and the hinges are strong. The height of these cupcake containers are perfect bec I do a lot of specialty cupcakes adding that extra touch to the top of my cupcake cakes and other containers in the last have squeezed my cupcakes. I love these high top 6ct cupcake containers. It’s not too big, yet each cavity is spacious enough for each cupcake, and I use the taller liners, like tulip and lotus! If you have a rectangular label you can cover the two separator notches very easily. The perfect height of the container allows plenty of room for a high swirl of frosting as well as toppings. My customers always comment that they love these containers as opposed to the boxes because of the transparency. The cupcakes are always visible and this is my go-to container for delivery. Ordered the 10 pack and now wishing I had ordered more! My customers seem to purchase the 6 cupcakes more than a full dozen so it’s very convenient. The quality is also great! This container holds 1/2 dozen cupcakes perfectly!! The high top allows adequate space to allow a nice amount of icing on the cupcake without smashing it down. The case is also easy to carry! These are perfect for small cupcake orders to go , keep items FRESH and easy to deliver. Definitely keep in rotation of orders for home bakers and professional s who want to package their product. Logos and Stickers fit perfectly on top. I love the high top cupcake holders! so many times I buy cupcake holders, and the frosting hits the top, ruining the cupcakes. this has never happened with these! they are high enough to pile your frosting on :) such a great buy! These are good for carrying muffins or cupcakes but for keeping them fresh, say overnight, you may need to wrap muffins individually. I think the plastic is a little too thin maybe?? My customers love these carriers. They give my shop that professional look. Holds the cupcake snug for safe transporting. Plenty of height for frostings and some types of decorations. These containers work perfect for me! Not everyone wants to order a dozen of cupcakes, or a dozen of chocolate covered strawberries. These containers work for both desserts when customers want a sweet tooth, but not too many. These cupcake containers are awesome for tall cupcakes....the lid allows plenty of room for swirls of icing. There is enough space in between each of the cavaties to grab the cupcakes without smashing any of the icing. The lids closes securely and they seem to stack fairly well. I recently started teaching a kids cupcakes decorating class. I pass these out as the kids start completing cupcakes. The high top assures that their sugar creations will not get smashed. These Polar Pak 6-cup HIgh Top Hinged OPS Plastic Cupcake Containers are a must have for our bakery. They hold cupcakes or muffins for sale. The high top allows for a good amount of frosting on the cupcakes. Easy to open and close, sturdy too. Wonderful containers. A few of them were a little hard to separate, but overall very good for the price. The dome is nice and high to leave plenty of room for frosting! Great quality containers I like the 6 count for orders that want mixed flavors. I like how the top is flat and smooth fit my logo perfectly. Nice and sturdy, and they make my cupcakes look very professional. I like how I can stack several of them and not worry about my cupcakes getting squished. They hold cupcakes. Mine are a little more snug than I like them to be. ALSO I cannot put any decoration on them without the being smushed. I like these because it makes placing and delivering cupcakes easy but id rather spend more using a box and inserts than not have to worry about my cupcakes moving or being crushed. These 6-cup high top containers are great! Really high top I can fit a three swirl of icing on top of a high cupcake and still have room! These polar pak 6 cup plastic cupcake container is sturdy and good for holding gourmet cupcakes. I use these for customers to take home cupcakes. These 6ct containers are perfect for our in-home Cupcakery. We use them for our overflow and sell them as sampler packs. They’re clear and showcase our product very well! Great containers I've used these before they are perfect for gourmet cupcakes great height for the frosting and decorations. Stores nicely. Holds the cupcakes well and perfect if someone doesn't want a full dozen cupcakes. These containers are perfect for my cupcakes with higher frosting or decorations on them. They are of good quality and durable when being transported. I will be purchasing them again. I use these all the time and they display well. These boxes stack and hold up well. They have a high dome so u can pile frosting on. Love, love, love these! They are a great way to make your cupcakes look like they came from a professional bakery! I just used them again this weekend for my Suoer Bowl cupcakes and everyone asked where I bought the cupcakes. They make transportation a breeze! These are easy to open and close. They are great for cupcakes that have added decoration or cupcake toppers. They have enough room that it doesn't smash the decoration. So in love with the Polar Pak plastic products. Not one size or option has failed us and the selection is terrific! Great value and highly recommend! Great cupcake containers. Easy to close and seal. Nice high dome to allow for extra icing and decorations. Grateful they shipped straight to our door because the box is heavy when it arrives. Great if you want to add decorative pieces on top of cupcakes, i.e. plastic toppers or cookies, etc. or if you just like to pipe a really tall mound of frosting. Only thing I don't like, which I forgot to mention in the low dome container review, is that the "lock" does not always click into place, often times it smashes flat instead of clicking in and it just doesn't close as a result, which gets frustrating. The price for these cupcake containers is the best! They came in perfect condition and they are very durable. I like how they are see through so customers know what they're getting. These are the perfect size for your standard cupcakes. They are sturdy and the lid does not collapse when stacked. We tend to use the higher dome more which allow us to pipe our frosting on high without getting smashed from the lid. It is a durable package that does a really good job displaying the cupcakes inside. Perfect for a regular size cupcake. Customers are always surprised and happy to see their cupcakes go home in these packages instead of the regular ol cardboard box. Good cupcake containers for the price. I purchased these for a fundraiser and have since used all but 10 of these containers. They are great for what they are, however, there are a couple minor issues with the finger holes. The holes do not quite line up for your fingers on some of the cupcakes and thus you have to push them up from the bottom to get them out. Aside from this small issue, I would buy these again. We love the Polar Pak 202 6-cup High Top Hinged containers! This was our first set of these as we weren't sure if there would be enough room for frosting. After getting them we have since re-ordered a bigger bulk. There's more than enough room for frosting and decorations on a standard sized cupcake. The high top cupcake containers are great. I put a lot of icing and sometimes decorations on my cupcakes. These did not smash the icing and deco down. The height on these is great! It's hard to find good quality cupcake containers with a nice high lid for decorated cupcakes and these are perfect. Live this containers, they are good to make orders to go. The container is tall enough, good to prevent the icing from touching the container. These cupcake containers are very good quality and I was able to use them more than once. I also found Webstaurant have a good deal on these than any other website. These worked perfect for a Scout Cupcake Wars Event for everyone to take home their cupcakes they decorated. Containers are very durable and easy to use! love, love, love these containers. My customers are impressed that I can provide "professional" carry out containers. Our standard cupcakes fit perfectly snug in the compartments and the high hinged lid is awesome. These high topped hinged plastic cupcake containers are the perfect weight and size for even all of my tallest cupcakes. A definite re-order list must! The boxes are just the best way to sell a half dozen of muffins to a customer. It looks way more professional if I sell my muffins in these containers. This cupcake holder is fantastic. It is durable and can be open and closed several times without damaging the product. It is tall so the icing doesn't get smashed for beautiful display. The Polar Pak 2020 6-Cup High Top Hinged OPS Plastic Cupcake Container is now a must have when I bake cupcakes. It is great for storage and I can stack many inside my refrigerator. The quality is pretty good and I highly recommend this product. Most cupcakes orders are sold by the dozen but your guest list does not always match the count. When attempting to not over back, you can use the 6 count cupcake high top hinged containers. These containers are strong and durable. They can also be used for chocolate covered strawberries. These are the standard type cupcake containers- I didn't have any issue with the height of the frosting but there weren't any picks inserted either to make them extra tall. If I wanted to keep the picks or over average height cupcake, I would go with an extended heights lid. These high top hinged cupcake togo containers work great, plenty of room for nice full looking cupcakes and surprisingly very sturdy. They make for nice counter top displays too. Perfect!! We ended up using these more than the 12 count ones in our bakery, as people prefer a smaller package. The high dome allows our decorated cupcakes not to be smooshed, too! These cupcake containers are great! We make and store cupcakes for our kids cooking classes, and these are the best way to keep, and transport them. I love these containers for my half dozen cupcakes. They are very sturdy and the lid is plenty high enough for a generous Icing mound! This cupcake container is the perfect way to package our cupcakes! The sections are high enough to ensure the frosting doesn't get smushed and the way the top clicks into the bottom reassures us that they won't come out while being transported! 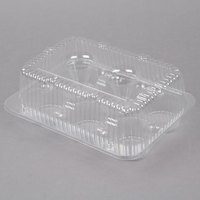 Looking for an alternative to folding boxes and separate inserts for my cupcakes, I gave these plastic containers a try. They definitely make packing up a six pack of cupcakes a breeze and save me time when I have a rush of customers. They hold my standard size cupcakes perfectly and have a ton of room for piled up frosting or when I use cookie toppers on my cupcakes. I'm glad to see that they are recyclable. I think in the long run they will save both time and money compared to the boxes I was using. These are great, good quality and tall cupcake containers! Close good and not a hassle to open. & biggest plus is that is Perfect for tall decoration and frosting! Truly recommend! These containers are awesome. I love them! They are not only great for muffins but also for those amazing cupcakes that come with lots of yummy frosting. I love using these to place my muffins and cupcakes in to give away as gifts since they are showoff the desserts even more. Beautiful containers. These are a good buy, they are nice and sturdy. We love the high dome to keep room for all the icing and extras on top of our cupcakes and even work great for our muffins. These 6 cup high top cupcake containers work perfectly for 1/2 dozen cupcakes in our bakery. Love the depth and fit. Great quality for the price! Sturdy containers for my muffins. The height is great for high decorations. Nice price and quality. No regrets. Will order more and recommend to others. These six pack containers are perfect for cupcakes with high frosting and extra decorations. They are not too big and also do not break easily. I purchased this to fit my JUMBO sized muffins. However, these are only 2", so they fit standard muffin tin sizes only (he height on the packaging is accurate, just not the bottom diameter of the individual muffin compartment). I called customer service on 12/20/16 and they said they will report the needed correction ASAP. On the bright side, they are sturdy (but a bit brittle, the tabs seem like they could crack if you're too rough with them-so be careful opening/closing with repeated use). These are fantastic. The nice and high domes allow for lots of icing and other decoration. Love that this is available in a small pack. Purchase these containers to give it a try. It's a little difficult trying to open the container once it's been closed. Unfortunately these containers did not meet my expectation simply because I use tall cupcake liners (1 3/4). If I used the standard liners, these would be great. Sturdy containers that I can stack on top of each other and the space between each cup is wide enough that I don't have to worry messing the frosting if I wanted to take one out. Would definitely recommend if you are using the standard liners (1 1/4 - 1 1/2 height). I love that these cupcake boxes have a high top. It's perfect for when I have a taller frosting or when I add toppings to the cupcakes. These containers are perfect for taking cupcakes to the farmers market. The containers hold the cupcakes snugly and are tall enough to accommodate as much icing as you can pull on top. These are the better cupcake containers than I could have imagined! They are durable, made of excellent quality plastic & have an amazing seal! I love them!!! I love having these 1/2 dozen cupcake containers at hand for when I have a few extra cupcakes at the end of an order. They make it easy to sell and give away small amounts, and the clamshell design keeps the cakes moist for several days in the event that a cupcake cannot be eaten right away. The lid is high enough that a nice swirl of frosting and basic decorations fit well. These are great not only for businesses, but for those like me who enjoy surprising others with home-baked treats. They give your cupcakes a professional look, and make them a lot easier to transport. They're also great for bakes sales, or nice little token gifts. Love the product but for cupcakes that are dome-shaped on top. If the cupcakes are just level full with frosting it is hard to get it off the container. The frosting gets all over. The holes are the exact size of a standard cupcake. Just the right height and size for what I need it for. Made of very sturdy plastic. I can't wait to start creating. Very happy with this item. These do the job for nicely decorated cupcakes, but the tabs are difficult to open once closed which can be rather frustrating and result in accidental cupcake tippage. This specific container is fantastic for my cupcakes piled high with frosting and goodies. Nothing spoils a cupcake more than missing frosting or having it completely stuck to the container lid, so I upgraded to these. I'm so happy to have found such incredible wholesale prices for them too! I use these containers when i bring cupcakes to parties and bake sales. I was looking for something tall since i apply a generous dome of frosting and fun toppings. These are perfect and I have never had a problem with anything touching the top of the lid. The closure is also very sturdy. Great product! I love their cupcake containers. I was afraid with the price that they were going to be flimsy and wouldn't latch; however, they are sturdy, latch and hold up very well. Very pleased with this product. I do all kinds of cupcakes. These are great for those with a higher frosting swirl. Does not smash the top and the package snaps securely. Sugarless deLite loves these cupcake holders. They maintain the products freshness which is the most important to our store. These are heavy duty and are worth the price. These cupcake containers are great for packaging half a dozen cupcakes that have been frosted. They stack nicely and are sturdy enough to not worry about crushing the ones on the bottom. These Cupcake holders are the best! They are made very well and sturdy! I am a business owner and they are perfect for my cupcakes. What I like the best is that they are the High Tops in which if I need to add extra decorations on top of my cupcakes, they fit!! He's cupcake containers are perfect for our customers to grab some cupcakes to go. There's also enough space to attach a label to the top for your business. Really like these containers. The are really convenient for cupcakes with high icing and decor. They also are very secure when you close them. Have purchased more. I sell items at local farmers markets and these cupcake containers are great for transporting and displaying my cupcakes. Customers love that they can see exactly what I'm selling. I ordered a cake of these plastic cupcake containers, and I love them. They are easily stackable and very high for those cupcakes with toppings or high frosting. I will definitely order again. These cupcake containers are excellent at transporting, storing and delivering my cupcakes. they are secure and don't open randomly. I even use these for muffins too. Very nice cupcake holder. They are sturdy and stack well when I am transporting them to my local farmers market. They are plenty high for fancy decorating on the top of the cupcake. The perfect cupcake holder for my business. Love the height, as it is perfect for my cupcakes that have decorative toppings. No icing will get destroyed in these! Great locking too. Will use many more in the future. We use these containers daily in our cupcake shop. They are the perfect fit for a standard size cupcakes. There is enough room in the containers for fun toppings, such as cookies and cherries. Your icing won't get smashed! I made minion cupcakes which had fondant on top of the cupcakes and the cupcakes fit into the compartment perfect. The cupcakes don't touch and the containers are clear which allows you to see through the container without opening. We love how economical these containers our and our customers love knowing that their cupcakes are secure in a container and won't fall over versus in a box. The high top cupcake containers are great. There is plenty of room for cupcakes that have a lot of icing or decorations. The cupcakes fit snuggly for easy transport. These cupcake containers were the perfect addition to our mobile dessert bar. They are tall enough for that high swirl, and because they don't require any assembly we didn't waste anytime serving our customers. I found that I really like this product, when I placed my cupcakes in they didn't go all the way down but they still look nice. Always use these! They work great. Easy to open and close without them cracking like most others do. I love shopping here, best prices and quality product! I brought the 6 count cupcake container. It's a good product with a high dome, so no worries on if wanting to decorate you'll have plenty of space. I am very happy with these half dozen cupcake holders. Tall enough for tall icing and the top and bottom snap into place very well. These container make my cupcakes look nice but be careful how big your cupcakes are as they sometime have to be forced to fit inside. I also have some difficulty with closing up the container. It's a struggle to snap it shut if you don't get it right the first time. We'be been using these for over 1 year & have been very pleased with them. They are tall enough to hold high frosting cupcakes. Durable enough to haul around, and they stay sealed well. Also economical! These clear carriers fit a good tall cupcake. I do have difficulty snapping the two ends to close it sometimes. They are a little bit more of flimsy plastic. It's not a bad thing since the purpose is to throw out anyways, but I'm extra cautious when i carry them with one hand. Still good though. We love these at our shop! Excellent quality, fits tall cupcakes nicely, containers are easy to pull off the stack- not stuck together, and snap closed securely. We buy them over and over again! These are perfect for small orders and vendor fairs. I have ordered them a couple times so far because they are great quality and affordable. Baking is my hobby so I am always making sweet treats...I generally try to give some away so that I don't eat them all myself! These cupcake containers are great for several reasons: They hold 6, so I can give someone a few without having to give away the whole batch. Also, the lid section is tall so I can heavily frost the cupcakes and not worry they get smashed, like in other boxes. These containers are very practical because they allow you to decorate cupcakes and use an amount of frosting that will not get ruined due to the high top. However, they are way too hard to pry open once they are closed. Half of my containers ended up broken from the hinged side due to the amount of force that had to be applied in order to open them, therefore, it was wasted, not to mention on a good amount of those instances, due to the sudden shake or movement, the cupcakes got ruined and had to be thrown away. They are not worth buying if you are going to toss half of them away. A total waste. Great product ! Easy to remove cupcakes from the container. Frosting stays intact. Display homemade cupcakes likes a professional. I will get more of these. I loved my 6 compartment container. Customers bought more cupcakes when they saw how nice they were placed in the containers. I will definitely buy again. This plastic cupcake container worked perfectly for regular size cupcake. The price was reasonable for 10 containers. I would purchase this item again when needed. These cupcake containers are great. They fit standard cupcakes perfectly. There is enough room on the side to get the cupcake out without ruining the frosting. It locks well. This is a great container for regular-sized cupcakes. There are little holes for our fingers to take out the cupcakes so it won't ruin the side of the cupcakes. The lock is sturdy and I like how it is stackable and stays in place. The dome is high enough that it won't ruin the top of the frosting. I prefer this over the Par-Pak 02086 4 Compartment Clear OPS Hinged Cupcake Container because the holes for the cupcakes fit perfectly for regular-sized cupcakes. The 4 compartment ones have slightly bigger holes. Highly recommend! I love the high top since I put all sorts of decorations on my cupcakes. This is easy to open, I've seen some that are a struggle to open. Great product! Tall enough to allow space for decorated cupcakes and even a small topper. This container is sturdy, has a professional appearance, and stacks well. These containers work great for our shop. We use them for every day orders and for deliveries. I think the size and durability are great! The 6-Cup High Top Hinged OPS Plastic Cupcake Container 10 pack is the perfect addition for the bakery, The hold the cupcakes perfectly in place, the price is right and the shipping was quick. These are very sturdy and durable cupcake containers. I love how they are just right for my cupcakes. I would recommend webstaurant to all of my friends. Love these cupcake holders. They are sturdy and they are tall enough that our frostings don't get smashed. Wish it came in a 12 pack! I have mixed feeling about this cupcake container. On the plus side, it is high topped, leaving plenty of room for icing and decorations on top of cupcakes. It also closes easily, is very clear plastic, and looks very good for presenting cupcakes. On the negative side, it is VERY difficult to get cupcakes out of the container once they have been put in. There are finger grooves for grabbing the cupcakes, but they are not deep enough, and you have to pinch the cupcakes to get them out. If they're refrigerated and bit harder, this isn't too difficult. But if they're not refrigerated, it's almost impossible to get a cupcake out without destroying the cupcake in the process. So in the end, the product works, but I may look at alternatives next time as the difficulty in removing the cupcakes can create a negative customer experience. Every house hold that ever bakes cupcakes need to keep some of these on hand. It protects the cupcakes so well and you do not have to worry about the icing getting messes up. Great product! Really like the high top on this container. You don't have to ever worry about frosting/decoration getting damaged or smeared in this container! Pile on the icing...It can handle it! These containers are perfect for my cupcake business, SugarTherapy by Ronnie! Not only are they great at helping me transport my delicious treats to customers, but the containers provide a very professional detail that makes people take notice. I believe you "eat with your eyes first." So, the ability to see my cupcake confections through the container is awesome! I will definitely stay stocked up! This cupcake holders are so awesome, the look is really neat and they are really affordable, you won't be disappointment with them is a really good addition to my cake busines for wedding testers! I liked it, especially when someone orders any cupcakes. The only thing is that the cupcake holder is too small. My cupcakes only fitbhalf way in. But besides that, I like it. I know I will live these if they are anything like their other products. I have a four count and dozen but needed a half dozen size. great product! what a bargain! we are suing it for our half dozen container and completely loving the product! it is sturdy and its clearly shows th cupcakes! Great product for a bakery! Very simple to use and they store great as well under my counter! Perfect for half dozen sales of cupcakes of chocolate covered berries! The Par-Pak 2020 Cupcake Containers are TRULEY "High Top" containers!! If you like to frost your Cupcakes HIGH, these are perfect! No having to worry about your frosting hitting the top of the containers anymore with these Cupcake containers! I just recently started my catering company and decided to do a sample batch and used these containers to deliver the cupcakes. I bought both these and the 12-cup ones by Par-Pak. These were harder to close than the 12-cup ones but they did the trick. I like the ability to see the product through the clear container as opposed to the cardboard bakery boxes that stain from grease easily. I just bought a few of these at first to see if they were any good, and I really liked them. they were plenty roomy for my tall cupcakes and very easy to open and close. I am going to order the large case next time. This is a great option for cupcake packaging. It keeps them separated so the frostings and decorations don't get damaged and lets the customer see them right through. It is a little too short for our 2 biggest cupcakes, however. These are wonderful! I bought a sample pack a while ago and finally used them (just started baking cupcakes). I couldn't resist the price deal so I bought the bulk pack of 200. I can't wait to use them. They cupcakes look so good and everyone thought they were store bought from a bakery because of the containers! Nice sturdy cupcake boxes! They are great for tall cupcakes and make the product look even better. These will be used with all my cupcakes from now on.